An impressive description of a weird. 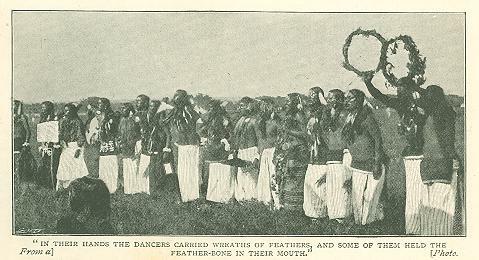 Pagan ceremonial, illustrated by photographs of the leaders and the dance itself - which, by the way, was intended to celebrate the uprising of the Indian and the annihilation of the "Pale-face." Mr. Draper points out the rarity of these photographs, the one of the dance in progress being the only print ever taken. 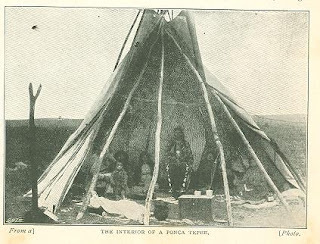 "STANDING YELLOW," the Ponca Indian prophet, came to the open­ing of his tepee, jerked a rough brown hand to his forehead, and scanned the prairie anxiously. As he drew his tall figure to its full height and threw his gaze to the south a smile spread over his cracked and wrinkled face. 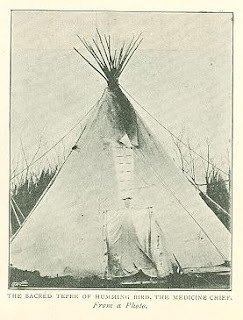 Then, hastily assuming a sober look, he retired to the sacred tepee and began again his long task of making medicine. The little dust cloud grew larger and nearer. Other clouds formed in all directions, and before the sun hid its face behind the surface of tall grass a hundred wagon loads of Indians had arrived and pitched their tepees round that of the old prophet. They jabbered to each other in their own tongue, and scowled fiercely at the few white men who had ridden along to witness the gathering. There was a scurrying about that would do credit to a gathering of commercial travelers, but all the time the flap of the Standing Yellow tepee remained closed. The Indians went by in groups, and pointed mysteriously at it. Some would bow their heads while near it, others would not go near at all. It was evident that they regarded the old prophet with respect, and even fear. 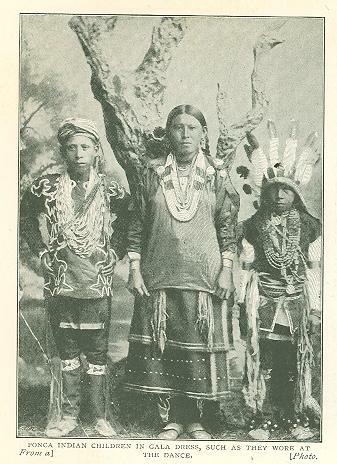 The Ponca Indians who live on their reserva­tion in the northern part of Oklahoma Territory are very superstitious, but they never engaged in the Ghost Dance of ten years ago when all the Indians of the western half of the United States were dancing it. 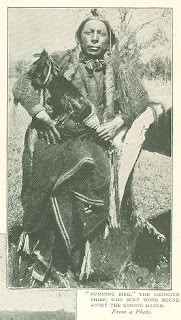 It was the belief of the Indians then that if they engaged in this dance the Great Spirit would fulfill a promise which some Indian prophets claim to have been made to them when they went on a visit to the other world. This promise was that the white people should all be killed, all dead Indians returned to life, and the game restored to the earth - a belief which is the Indians' heaven and the basis of all their religion. Of course, the time passed for the pro­mised end of the world, yet nothing happened. Some of the Indians were transformed into sinners, according to the Indian code of ethics, but a majority of them yet held faith; they gave up the dance, but they did not forget the pro­mises. 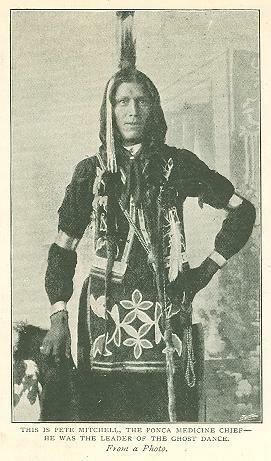 Standing Yellow was then a great prophet among the Southwest tribes, and his people of the Ponca tribe had implicit faith in him. When the Otoes and the Arapahoes began to have Ghost Dances the Poncas grew restless and visited their prophet. But he shook his head and said the time for the dance had not yet arrived. When it did he would inform them. The Poncas refrained from the Ghost Dance then. This was the reason for the recent gather­ing of the Poncas on their reservation. Standing Yellow had sent out the long looked for message. It was carried from tepee to tepee by Humming Bird, the medicine man. Standing Yellow said that a crow had flown over his wigwam and plucked out his heart. Then with a new heart he was carried into a cloud, and finally ap­peared before the Master of Life. After a long talk about his faithful­ness the Master bade him start the Ghost Dance, and said further that he would then come down and wipe the white people from the earth. This is the version given by the prophet, and his people said it must be so. 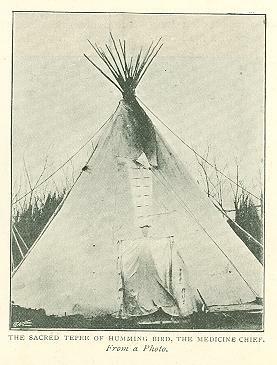 It was long before daylight that the Indian camp was astir. Dark forms, wrapped closely in heavy red blankets, dodged between the tents and bent over small fires. Inside the thick canvas the Indian dancers were putting on the sacred paint. The squaws outside were frying a scant breakfast. Medicine men scurried in and out of the tents with great cans full of the sacred paint. They daubed a big warrior twice on the nose and three times on the chin, ran a yellow line across each cheek, and a red figure shaped itself on his forehead. Some­times this figure was a crow, then an eagle, again a snake - any­thing the fanciful medicine man cared to make it. They claimed that this paint­ing was done by inspiration. It certainly was far from being artistic, judged by the civilized standpoint. At dawn the Indians, 500 strong, were ready for the great dance. All their pent-up enthusiasm broke loose. It had been a ten year struggle, hoping against hope as it were that this time would hasten the end. Now the wish was gratified. The stillness of the fresh morning air was suddenly broken by the beating of a huge drum. It came from the direc­tion of the river, and thither all the Indians rushed. There. they beheld Standing Yellow on his pony. He raised his hands in a tragic manner and commenced to talk. The Indians listened with breathless interest. His speech was a long harangue against the whites and a story of his impossible trip to the clouds. He recited with great impressive­ness how' the Great Spirit received him, gave him the dance, and told him the world was' soon to end. Then he commanded Humming Bird, as the chief medicine man of the tribe, to show the Indians the dance as he had been taught by the prophet, Standing Yellow. It was below the dignity of Standing Yellow himself to teach them the dance. The dancers hopped higher and faster, and chanted their weird song louder as the sun's rays fell straighter upon them. Then they commenced to fall from exhaustion and excitement. The medicine men said that it was the work of the Great Spirit. While they lay in the dust and heat of the dancing circle no one went near them, as they were supposed to be communing with dead relatives. Some lay in the trance for hours, and then went on with the dance. At night fires were built in the circle, and the dancers kept on until midnight, when all went and bathed in the river. At daybreak they were again ready for the dance. This performance was kept up for six days, during which time dele­gates from all the other tribes in Oklahoma appeared and engaged in the dance. This was one of the largest Ghost Dances ever held in the Southwest, and the first in ten years. Originally published in The Wide World Magazine. December 1890.